﻿ James 3:4 Behold, the ships also, though they are so great and are driven by rough winds, are yet turned about by a very small rudder, whither the impulse of the steersman willeth. Behold also the ships, being so great and driven by fierce winds, are guided about by a very small rudder, wherever the impulse of the man who steers determines. Likewise, look at the ships: though they are so great and are driven by rough winds, they are steered by a very small rudder wherever the impulse of the helmsman determines. 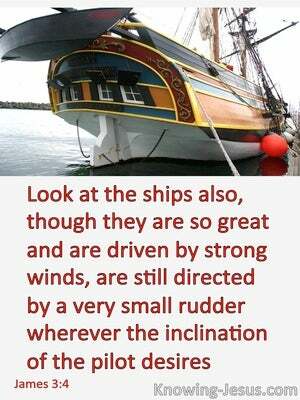 Look, even though ships are huge and are driven by strong winds, still their direction can be governed by a very small rudder, wherever the pilot desires to sail. Behold also the ships, which are very great, and are driven by violent winds; yet they are turned about by a very small helm, to whatever point the will of him that directs it may determine. And again ships, though they are so great and are moved by violent winds, are turned by a very small guiding-blade, at the impulse of the man who is using it. a ship too of the greatest burthen, tho' the wind bears hard, by means of an inconsiderable helm, veers about as the hand of the pilot directs her. Even ships, great as they are, and driven by strong winds, are steered with a very small rudder wherever the pilot pleases. Behold also the ships, tho' they are so great, and driven by fierce winds, yet are turned about by a very small helm, whithersoever the pilot listeth. Behold also ships, being so great, and driven by hard winds, are led by the smallest rudder, wherever the desire of him steering should will. Behold also ships: [although they] are so large and are driven by strong winds, they are guided by a very small rudder wherever the inclination of the pilot wishes. Behold also the ships being so great, and driven by fierce winds, yet they are turned about with a very small rudder, where the impulse of him steering desires. Look at ships too; for all their size and speed under stiff winds, they are turned by a tiny rudder wherever the mind of the steersman chooses. Look at the ships too, though they are so large, even when driven by fierce winds they are turned by a very small rudder, wherever the impulse of the helmsman wills. Behold also the ships, which, though they are so great, and driven by fierce winds, are yet turned about with a very small rudder, whithersoever the steersman chooseth. Lo! the ships also, large as they are, and, by rough winds, driven along, are turned about by a very small helm, whithersoever the impulse of the steersman inclineth. Behold also the ships, though so great, and driven by tempestuous winds, are turned about by the smallest rudder, whithersoever the inclination of the pilot pleaseth. 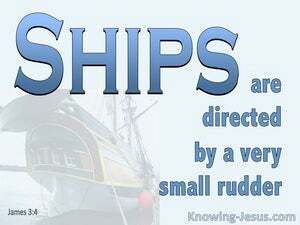 Again, think of ships. Large as they are, and even when driven by fierce winds, they are controlled by a very small rudder and steered in whatever direction the man at the helm may determine. Look at ships, too; though great and driven by violent winds, they are steered with a tiny rudder wherever the pilot pleases. Behold also the ships, large as they are, and driven along by fierce winds, are turned about by a very small rudder, wheresoever the impulse of the steersman wills. Behold also the ships which are of so great bulk, and even when they are driven by hard winds, yet are turned about by a very small helm which way soever the pilot pleaseth. 3 Now if we put the horses bridles into their mouths that they may obey us, we turn about their whole body also. 4 Behold, the ships also, though they are so great and are driven by rough winds, are yet turned about by a very small rudder, whither the impulse of the steersman willeth. 5 So the tongue also is a little member, and boasteth great things. Behold, how much wood is kindled by how small a fire! But Jehovah sent out a great wind upon the sea, and there was a mighty tempest on the sea, so that the ship was like to be broken.